Fr. 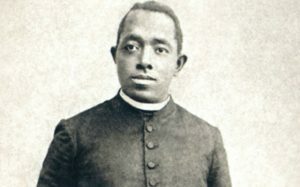 Augustus Tolton was the first recognized African American Catholic priest. Born into slavery in Missouri on April 1, 1854, and was baptized Catholic. His family escaped when he was a child and ran away to Illinois, a free state. Tolton later felt called to the priesthood, but faced much opposition and no American seminary would accepted him. With help from an Irish Franciscan priest, Peter McGirr, he was accepted to study in Rome. He ordained on April 24, 1886, and sent back to the United States. He first ministered to black Catholics in Quincy, Illinois and was later transferred to Chicago. After some time in Chicago he led the establishment of an ethnically black Catholic parish, St. Monica’s, which still survives to this day as St. Elizabeth’s. He faced both racial opposition and triumph over the course of his priesthood. He died at the age of 43 on July 9, 1897 after collapsing the previous day upon returning from a priests retreat during heat wave that swept the city that year. His solemn Requiem Mass was attended by more than 100 brother priests and a crowd that overflowed the church. There’s ALOT more to his story, but I just wanted to have this much here. With all this said and for the fact that this apostolate was started on April 1, 2018, the 132nd anniversary of his birth, it is only right that Fr. Tolton is a patron for BLACKCATHOLIC. – Cardinal Giovanni Simeoni announcing to the committee deciding where Tolton would be sent in the world after ordination. The Cardinal overruled the previous decision to send him to Africa. His Cause for sainthood is ongoing; he has been declared Servant of God, the first step towards canonization.